To begin with, as far as Oregon mines, I will introduce you to the Oregon cinnabar mines. Those are the ones I have explored at length. I’ll get to some of the silver and gold mines as I wander further. 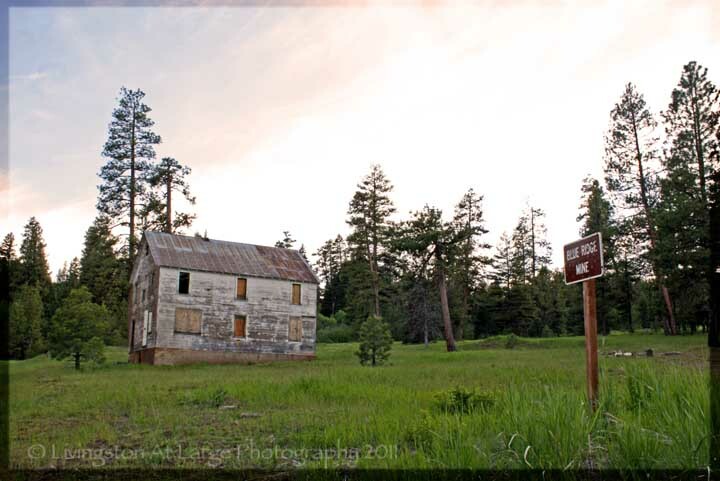 Located all around the Ochoco mountains, in the Ochoco National Forest, are the remains of the some of the Oregon mines from heyday of the Oregon cinnabar mining days. They are fun to explore without a lot of effort. Most are very easy to get to and if you are looking for some HDR photography material, they are a bonanza! 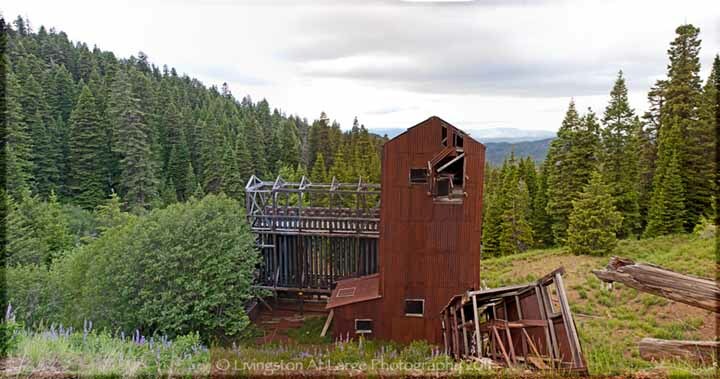 From the early 1900’s to the 1930’s cinnabar mining was king in this area east of Prineville, Oregon. They were extracting the mercury from cinnabar drop by drop to use it in the silver and gold mining industries in other local mining efforts. At some point, one by one, they just walked away leaving the equipment and buildings. 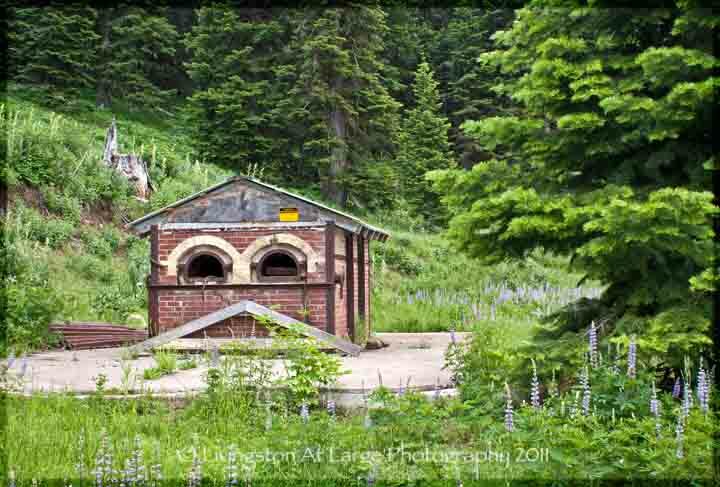 In the late 1980’s the Forest Service started looking into the abandoned Oregon mines, and the possibilities of dangerous chemical contamination. 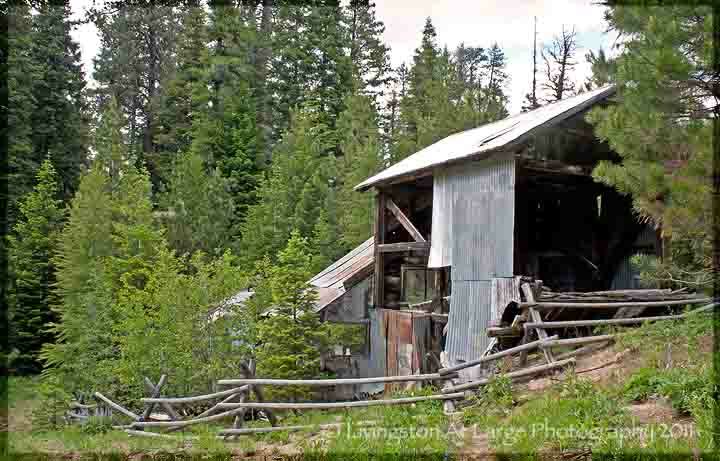 There were so many mines in their region that they had to sort… In the Ochocos, the mercury mine that got first priority was the Mother Lode and Independent mines because of its popular trail that went by the mouth of the mine and the enticing buildings. The Forest Service did cleanup work in there in the late 1990s, for which I am eternally grateful because I love it there. The Blue Ridge clean up followed shortly after. Here are some of my favorites. They are my favorites because there is still a lot of stuff there, buildings and equipment and the like. I never even knew there were Oregon mines just sitting out there waiting for me. This mine was our first. We literally stumbled upon on our way to Big Summit Prairie. We came around a corner on the highway and saw this, which in true photographer fashion made me yell “STOPPPPPPPP” (which my husband is quite used to). 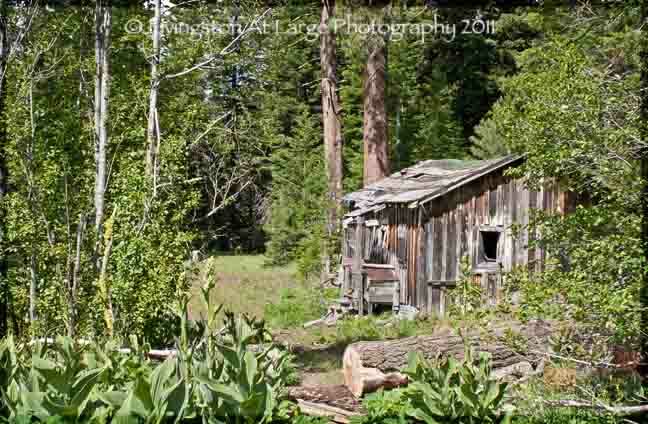 he was off exploring the little road and came upon the old processing shacks, which he was kind enough to drag me back to. Here is a little history of this mine. Blue Ridge Mine located on Round Mountain Rd. was first developed in 1930. Over the next twenty years or so, miners produced between 271 and 301 flasks of mercury from the cinnabar mined there. …..and guess what I’m allergic to. I happen to love bees and I’m not afraid of them, but there are limits (unbelievably), to my stupidity. Okay, I confess. I haven’t been inside because I am short and the open spot is too high off the ground for me to get inside without help. Don’t think I didn’t consider it just because I might die…. 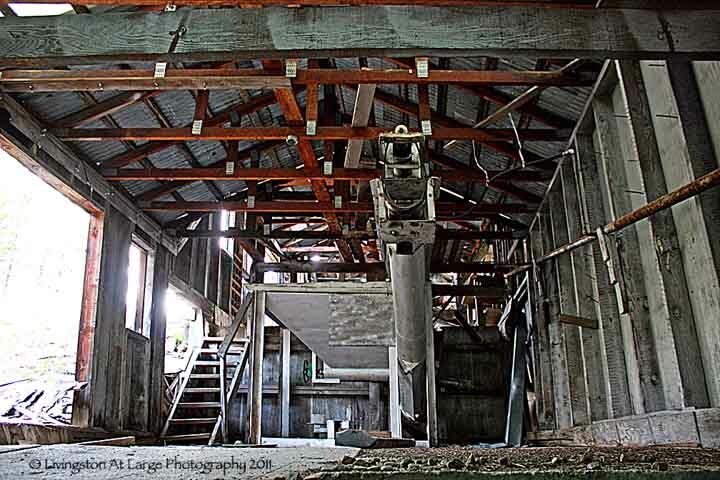 Now, the mine processing building I have been inside several times. It is really surprisingly stable and has lots of great equipment. I was really intrigued by all the equipment, and for once it seemed not horribly dangerous. I sure would watch for snakes though. It is also an HDR photography dreamland. The mine closed sometime in 1958 and the stuff was abandoned. 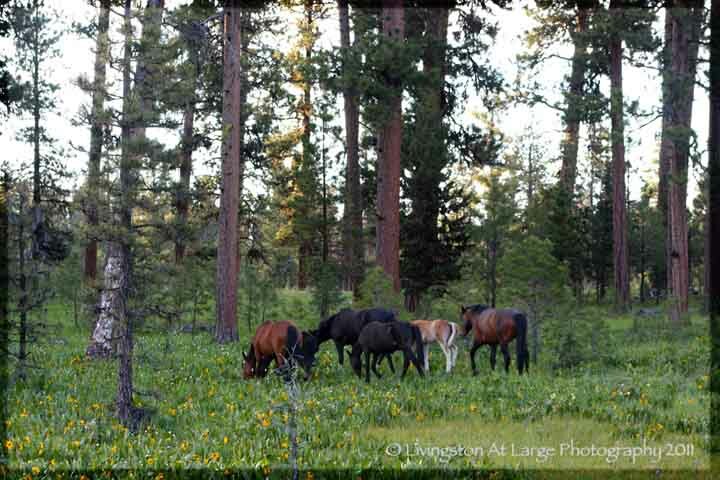 I should mention, as a bonus, sometimes the wild horses hang out near the Blue Ridge Mine. From Prineville keep going east on The Ochoco Hwy (26) East. Fifteen miles out of town, turn right where it says to Big Summit Prairie. 8 miles on (just past Ranger station) veer to the right on USFS Road 42 (Canyon Creek Rd). Go past the signs for the independent Mine and the Amity Mine and just drive until you see that big abandoned Four Horseman building on your left! The Independent Mine is located off of USFS 42 on Lookout Mountain outside of Prineville. The road has signs announcing the mine until you get close and then you need to watch on the left for the trail marker and just park on the side of the road. 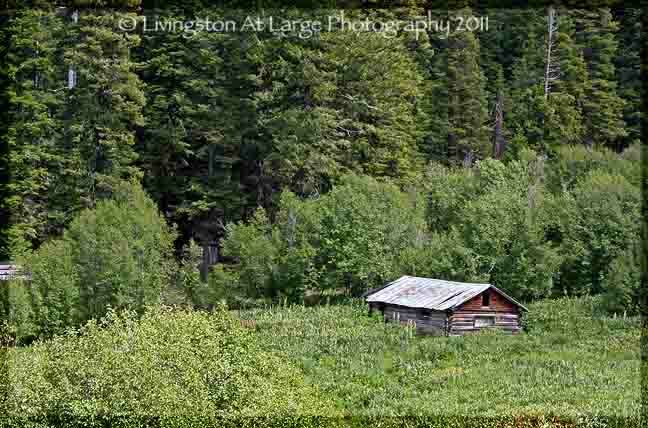 Hidden down in a little valley, you can see a log cabin or two from the road. It’s a short hike through the forest off the Baneberry Nature Trail #812. More and more buildings begin to appear as you hike in (and really I mean walk in). I am particularly fond of this one because it is almost SOOC (Straight Out Of Camera), but it looks like HDR Photography. In season, there are a lot of great wildflowers to photograph along the way depending on the season. I found columbines as well as a nice variety of yellow and purple flowers that I didn’t identify. There is also some kind of prehistoric looking vegetation that is very large and everywhere. I think this is my favorite of the Oregon mines I've been to. Each one has it’s own charm but this one has the best equipment. 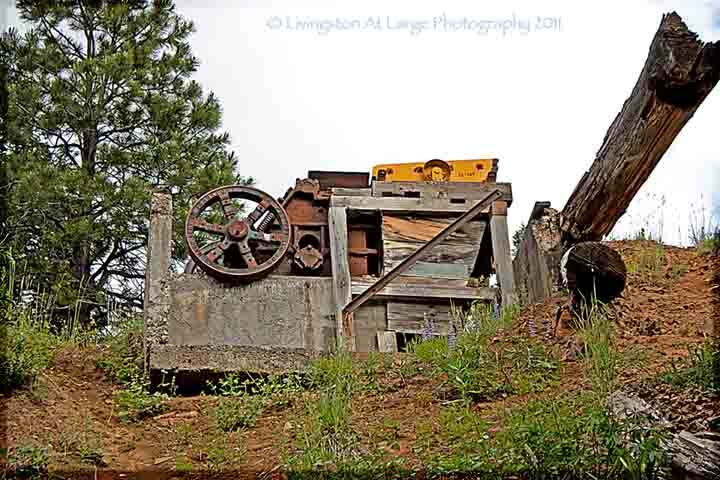 I believe as far as Oregon mines go, it was also one of the most productive. After you go back to your vehicle from the Independent Mine, keep driving down that same road until it dead-ends. In front of you will be three options. Going on the trail directly in front of you, or going to the trail on the right will both take you to The Mother Lode Mine. 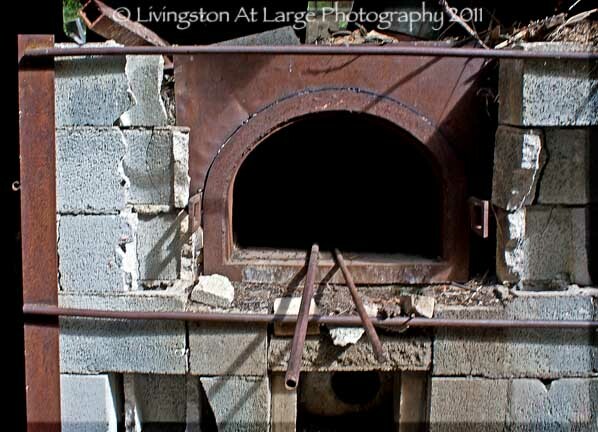 The trail directly in front of you will also take you to the cool little kilns. 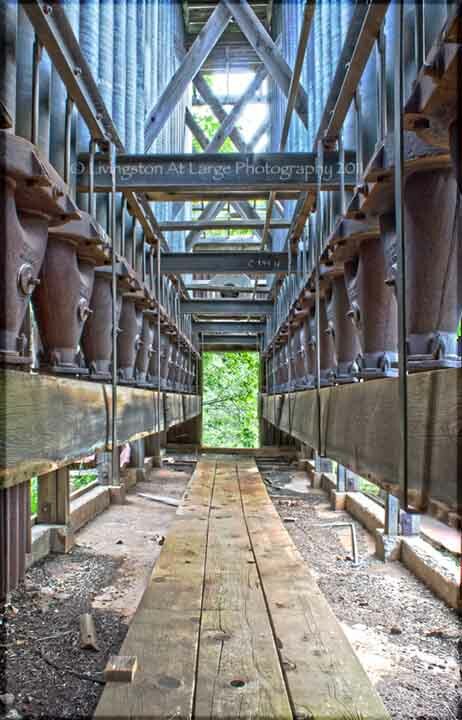 This is part of the big hopper. and these are the fascinating radiator processing thingys (like my technical jargon?) 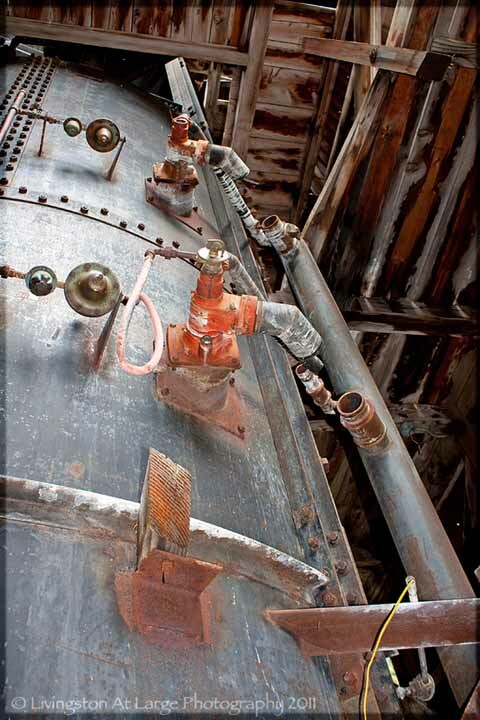 They look like some kind of radiator style extraction system and they are an HDR Photography playland! The danger of the climb up to the equipment on the hill can be greatly reduced by using the trail off to the left. I wish I had found it before I braved the possibility of snakes and climbed up inside the old chute.....backwards. From the top you can get some great panorama photos. 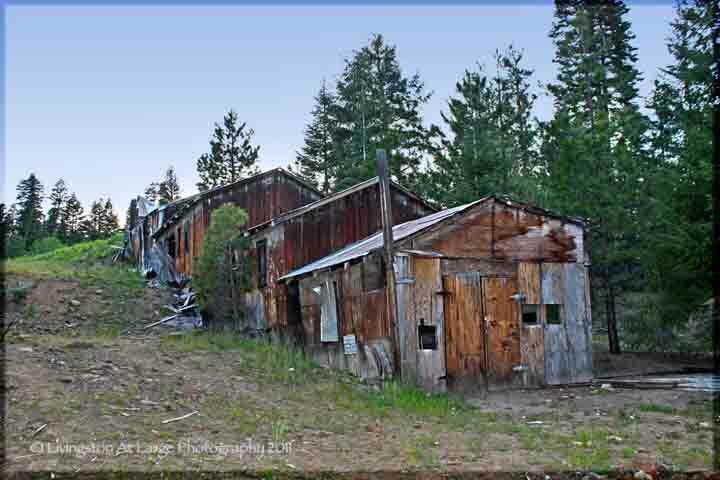 There are many more Oregon mines around. The Amity mine is right there on the mountain road between the Independence and The Blue Ridge but it requires quite a hike down to it and I always seem to get there around dark after I’ve been exploring other mines. Some of the Oregon mines listed on local maps are on private property and I ran afoul of some owners thanks to a map I got from a place that didn’t differentiate what was private and what was not. Actually, the owners were very nice to me after I showed them the map, but firm in respect to their private property (they did let me take some photos after a short lecture, where I stood and listened attentively and of course displayed dutiful remorse.) 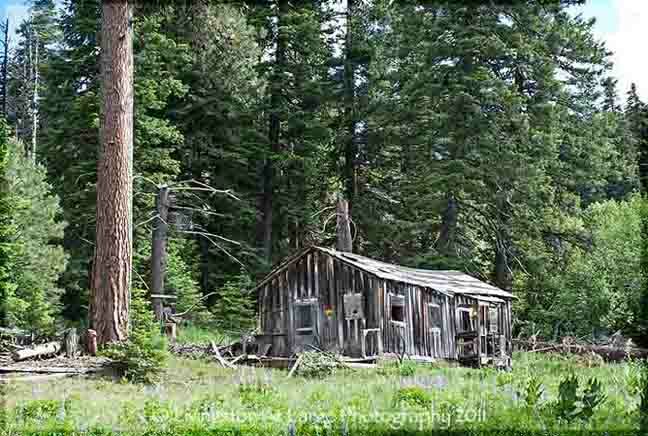 Lastly some of the old Oregon mines are, well, nothing is left. Our biggest find out here besides the mines, was a lost basset hound in the forest. Scared the tar out of us because we couldn’t exactly figure out what that THING was making that HORRIBLE noise coming at us ……Out in the forest your mind is not really set to think ”Basset Hound”, more like “Cougar” or “Bear”. We also finally found his owner walking down a road from a campground with an empty leash looking pissed. :) Whew, just what we need to go along with our other strays. If you have the time, stop in at the Bowman Museum in Prineville, Oregon. They have some maps and history of the mines. 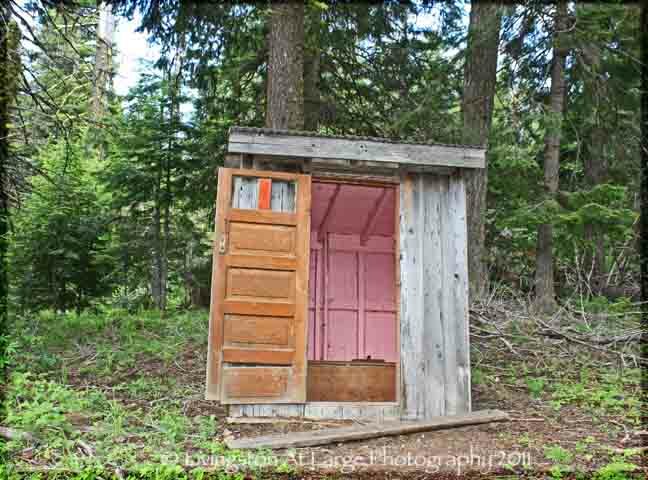 Just remember what I said about private property. 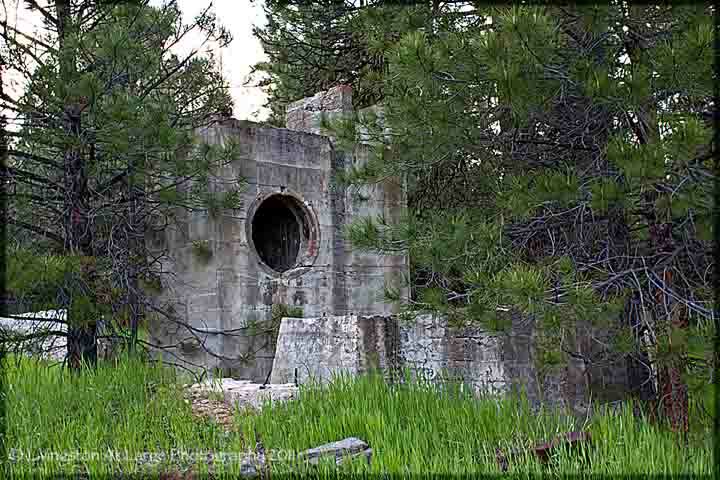 All the mines I’ve shown you photographs of, are on Forest Service PUBLIC lands. There are also some gold and silver mines in the Madras area. As I get to them I’ll fill you in. If you’ve been to them….Fill US in! After you are done there, continue on up the road where it dead ends to the Mother Lode Mine. There will be three trail options. Take the one straight ahead to the little kilns or the one to the right. Either will take you back to the big mine. Have fun at the Oregon mines!